1. A-line underskirt in medium gray crinkled fabric. 2. Fitted bodice in medium gray crinkled fabric with a high structured collar and princess drop waist. 3. Floor length coat in a medium, almost dark purplish-gray velveteen fabric with a houndstooth-like pattern. The coat has a large shawl collar with a second lapel lined in iridescent turquoise and silver silken fabric beneath the main collar drafted to form contoured pockets that end at mid-thigh, with the bottom points each tied in a knot. An embroidered, peacock feather-like decoration rimmed in gold cord, in colors of purple, gold, blue, orange and gray, is attached to a wide band of coat velveteen and forms the closure of the coat. 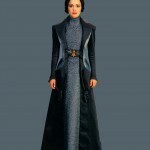 The coat also has long fitted sleeves which flair at the knuckles and has a small train length in the back. 4. Hair is parted in the center with the back portion gather into two high coils at the crown of the head with smaller coils at the base in front and back, and two front sections braided and softly draped to the back and wrapped about the coils. No bangs. Naturally-occurring hair colors only.